A noose erected by a Buffalo homeowner as a "political statement" last week has been removed, to the relief and delight of elected officials and neighbors who condemned it as a hurtful reminder of the nation's history. 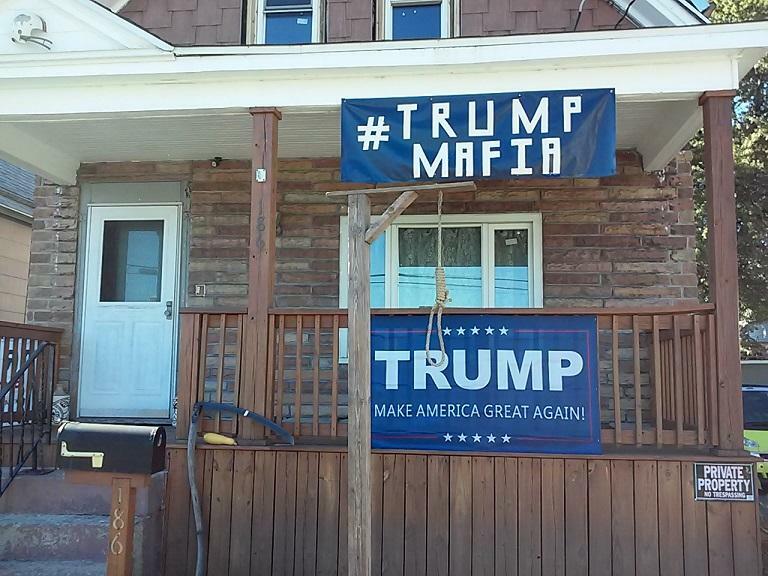 The noose was part of a broader display featuring various flags and signs supporting presidential candidate Donald Trump, including a social media hashtag "#TrumpMafia." The homeowner, Egbert Bickley, explained on Friday that it was his political statement about the state of the nation and the direction he feared it is going. A controversial political display outside a Buffalo home has been taken down. The photo at left shows the home last Friday, when a noose and signs supporting presidential candidate Donald Trump were set up. The photo at right shows the home on Monday morning, when the noose and all signs and banners were removed. News of the noose's removal was welcomed by those who expressed their disapproval just a few days before. "I really appreciate the fact that he took it down," said Erie County Legislator Barbara Miller Williams, who joined fellow Legislator Patrick Burke and State Senator Tim Kennedy in condemning the noose on Friday. "I recognize it is his right to express himself. But I am grateful that he took into consideration the feelings of the community, and it has been taken down." WBFO visited Bickley's house on Monday but knocks on the door were not answered. When he met with WBFO outside his home the previous Friday, Bickley hinted he had been thinking about taking it down after hearing some of the backlash and even receiving threats of harm. "I considered that it's been so upsetting to people that I've considered taking it down. But then I think that defines my right," said Bickley to WBFO on October 14 about his display. A former neighbor who has family still living in the neighborhood says the noose was an unwanted distraction. But Kennie Wylie, who has mixed-race family members, suggested it was not surprising. "Babcock Street is definitely one racist street out of the whole, entire neighborhood," Wylie said. "Nobody likes blacks over there. They don't like any other race besides the whites." There's a noose on display in front of one home in Buffalo's Seneca-Babcock neighborhood and it's not a Halloween prop. It is part of what the homeowner admits is a political protest, but the symbol of that protest isn't sitting well with many, including several local elected officials.